Cook any frozen or root vegetables until ready and cut into bite size pieces. If using fresh veg such as peppers or courgette there is no need to cook first. Meanwhile fry onion in a large pan with a few sprays of frylight. Add the curry powder, garam masala and veg stock and simmer for a few minutes till the liquid is reduced by half. Add all the vegetables and stir through the stock. Add the passata and stir though. Reduce the heat and allow mixture to cook and thicken to desired consistency. Garnish with some coriander and serve with rice. When i'm cooking meals I love the colours of naturals foods as well as tantalising smells which make you want to devour the dish as soon as it's ready. 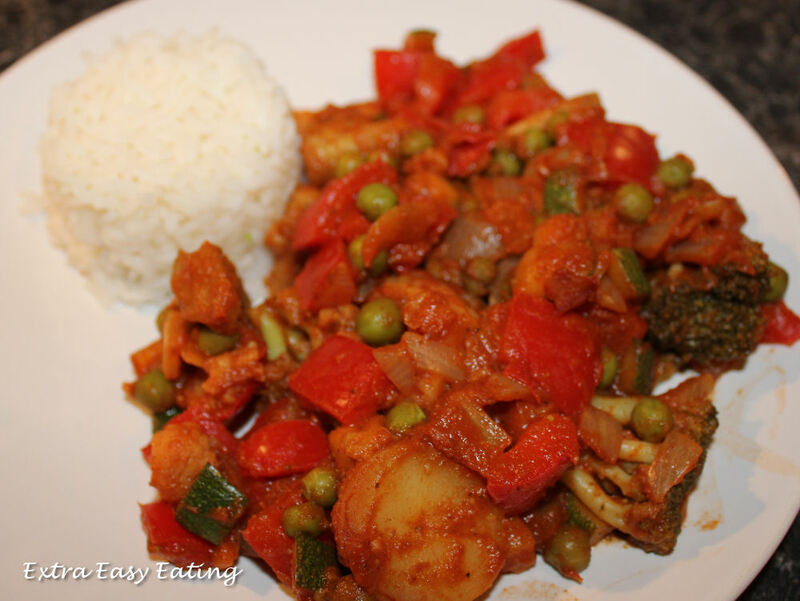 This dish certainly ticks these boxes for me with its wonderful array of greens and reds of the ingredients and the gorgeous aroma of the curry spices. This dish was yummy and very simple to make. Perfect for vegetarians or if you're like me and just prefer a meat free meal every now and then. I used Tescos medium curry powder, but you can get spices milder or hotter versions in most supermarket. Extra easy eating. Picture Window theme. Theme images by linearcurves. Powered by Blogger.